The Ebac 6200 Dehumidifier, made by the UK's leading dehumidifier manufacturer, is one of two models in the Ebac 6000 series. It is designed to dehumidify a home of up to 5 bedrooms with a floor area not exceeding 250m2. The slightly smaller capacity Ebac 6100 dehumidifier has an extraction rate of 21 litres per day and is suitable for a 4 bedroom home of up to 210m2. The 6100 is also slightly louder in operation at 49dB but in all other respects is identical to its more powerful cousin. Both the Ebac 6200 dehumidifier and the 6100 come in three colour options: Silver and Steel, Blonde Oak and Mahogany. Unlike the 6200 the Ebac 6100 dehumidifier is also available in White. The colour options come at different prices with Silver and Steel being slightly more expensive. These differences apart, this review applies equally to both appliances. This device, being designed for larger homes, has amongst the highest capacity of any dehumidifier manufactured by Ebac. Visually the design is stylish and "tidy" without the customary air-grill on the front panel. The colour options are intended to allow the buyer to select their Ebac 6200 dehumidifier to blend with their furniture and decor. This dehumidifier comes with all of Ebac's energy saving technology integrated within the appliance. This includes SMART Control™, a device that "memorises" changing levels of humidity over a 24 hour period and then "anticipates" these changes over the following period, adjusting the times and periods for which it operates accordingly. Ebac claim a 30% improvement in energy efficiency, compared with dehumidifiers in the same class, for this gadget. The Ebac 6200 dehumidifier is also equipped with "intelligent defrost". All dehumidifiers which rely on water vapour condensing on refrigeration coils are liable to the formation of ice on the coils in cooler temperatures, anything below 18°C. Some dehumidifiers use a "hot gas defrost" system to melt the ice but with intelligent defrost the Ebac 6200 dehumidifier anticipates the formation of ice and suspends refrigeration of the coils. This results in a speedier defrost and less energy consumption. The machine is also equipped with hydrophilic coils which accelerate the speed at which water drips from the coils. This makes the condensation and collection of water more efficient and saves further energy. The Ebac 6200 dehumidifier includes an adjustable humidistat which enables the user to pre-set the desired level of humidity and causes the machine to switch off once this level is achieved. This prevents both wasteful use of electricity and reduction of humidity to uncomfortable levels. The Ebac 6200 dehumidifier is capable of a maximum water extraction rate of 25 litres per day. Please do not expect that rate to be achieved in the conditions normally found in your home. In the table below you will see that the figure of 25 litres was recorded at a temperature of 32°C and a relative humidity of 90%. Extraction rates fall dramatically in cooler, less humid conditions. All dehumidifier suppliers quote the figure this way. What it tells you is that one dehumidifier will extract more water in a given time than another. Quoting the rate under "standard" conditions, however unrealistic, makes it possible to compare two different dehumidifiers on a level playing field. The Ebac 6200 dehumidifier comes with an additional feature, "boost control". This setting causes the machine to operate at its maximum water extraction rate for up to eight hours which can be useful for indoor drying of laundry for example. If the machine is bought directly from Ebac it comes with a free five year warranty but this is not available if purchased through a third party suppler. Other suppliers may offer the Ebac 6200 at lower prices but different, usually lesser warranties are offered as standard and extensions are only available for an additional charge. If repairs are necessary they will have to be arranged directly with the supplier, not the company. Ebac has a 30 day return policy but, once again, refunds and replacements are only dealt with by Ebac if you buy your dehumidifier direct from the company. When comparing purchase costs a more accurate picture is gained by adding the cost of any "extended" warranty offered by a retailer to the ticket price and looking at that alongside the Ebac company's all inclusive price. The energy efficiency of this machine is its biggest advantage and will have an impact on the life-time costs of the machine. Ebac trades on its reputation for reliability and this too will influence total costs. It is only fair to say here that a few purchasers have written reviews which raise at least some doubts whether this reputation is deserved in the case of the 6000 series. The Ebac 6200 dehumidifier has the further advantage of versatilty. With its intelligent defrost system it is capable of operating at much lower temperatures than other dehumidifiers without a defrost system. 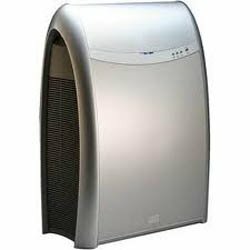 This could be an advantage if you have occasional need for a dehumidifier in a place such as your garage but we would not suggest this machine as the most suitable choice if it was to be used exclusively in such a location. There are less expensive alternatives. The main disadvantage of this appliance is its relatively high initial price. There is a trade-off to be made between purchase costs and life-time costs and you will have to consider that in light of your personal circumstances and priorities. A second disadvantage is the relatively high operating noise of this machine. This is particularly the case with the Ebac 6100 dehumidifier which is recorded at 49dB, 2 dB higher than the 6200. Decibels do not increase according to a simple linear scale but are so called "logarithmic units". In simple terms this means 49 dB is more than simply 2/47 louder than 47db. For a full explanation visit this page at Wikipedia. Choice of settings, including the automatic "Smart Control"